Villa Homes takes the top award from the RGV Parade of Homes! Parade of Homes RGV Award winners 2018 were announced in two categories- Model Homes & Spec Homes. Out of the 27 homes presented before the Rio Grande Valley Builders Association, the finest homes with top architectural styles won the best home awards. Villa Homes has won the top honor- ‘Best of Show’ awarded to the top RGV home builders. Some of the other prizes included best awards for master and bath, kitchen, and curb appeal. Let us have a look at some of the award categories. 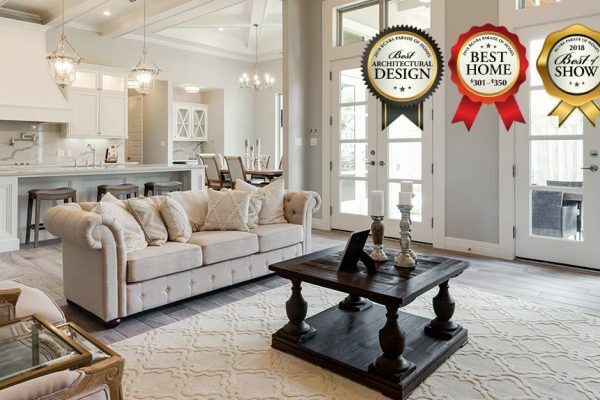 Villa Homes designed and made by the Villanueva family took the top honor “Best of Show Home” from the prestigious Parade of Homes RGV awards competition. Placed in the price range $301-350K category, it also collected the “Best Architectural Design”, “Best Master and Bath”, Best Kitchen” and “Best Single Family Home”. Excellent craftsmanship, as is evident from the ivory stone pillars contrasting with charcoal gray roof tiles, decorative landscaping, and a stamped concrete driveway are just a few of the factors that could have made it clinch the “Best of Show” award. Innovative Homes, created by Peter Vargas and Mayra Martinez is the recipient of the “Best Model Home” award. Falling in the category of $301-350K, the designers have used light colors in the exterior and interiors. The simplicity of rectilinear lines together with the soft contours of the stone and stucco structure of the home presents a delightful aspect. A wooden look porcelain plank leading to a 21’ high living space makes for stunning interiors. An entire wall of the living room is devoted to windows allowing for optimum entry of natural light. Sorrento Fine Homes in the $251-300K category presented by Sandra Brown are unique in design, highly energy efficient, and available at the right price. Both exteriors and interiors use contemporary architecture blended with Tuscan style. A mahogany door set in a stone and stucco structure leads to an interior with soft colored walls. One wall has a large window area, making for advantageous use of natural light. A cozy dining area integrates the kitchen with the living space. A main living area that is viewed beyond the entrance makes you awe the minute you get a glimpse of this gorgeous house. An inviting fireplace sets the tone for this modern palace. Custom French doors, bookshelves and built-ins complement its aesthetic. Only topped by its high cathedral ceiling, massive chandelier. As if the open living room space wasn’t marveling enough, the house includes a chef’s dream kitchen. Also by Villa Homes RGV, it features marble quartz countertops, modern chandeliers, large walk-in Butler’s pantry, and even a wine refrigerator. This award winning house definitely has it all! A large and private master suite, complete with a bowed cozy window seating area and its own private patio, also designed by Villa Homes, were the obvious choice to receive the ‘Best Master and Bath’ award. An ample and opulent bath comprised of separate sinks, vanities and glassed-in showers, white porcelain floor, an ample walk in closet, a modern chandelier and a cutting-edge soaking tube also make up this award-wining house. Other award categories include“Best Curb Appeal” “Best Special Home” and “Most Energy Efficient”. See you in Parade of Homes RGV Winners 2019! As always, we strive to continue our highest commitment to our customers and friends when building top quality homes in the Rio Grande Valley. If you want to look at the rest of the photos, please click here to see the 2018 RGVBA Parade of Homes Guidebook. Parade of Homes RGV Award winners 2018 were announced in two categories- Model Homes & Spec Homes.